This Airline chair was commissioned for the Walt Disney Studios, Burbank, Los Angeles and made in 1939. Kem Weber was the architect of the building and the upholstery was chosen by the client. The name of the chair expressed the desire to associate the design with the most up-to-date development in modern industry. Throughout the 1930s, a number of experimental passenger flights were completed. The first transatlantic passenger service was held on 28th June, 1939 between New York and Marseilles, France. Weber sought to make a 'comfortable, hygienic and beautiful chair inexpensively'. The result featured a cantilevered seat and a knockdown design. The strength of the frame allowed the designer to dispense with the rear legs giving the sitter a more comfortable, resilient seat. The chair was easy to assemble; it came in a flat, square box relatively inexpensive for a manufacturer to store and ship. 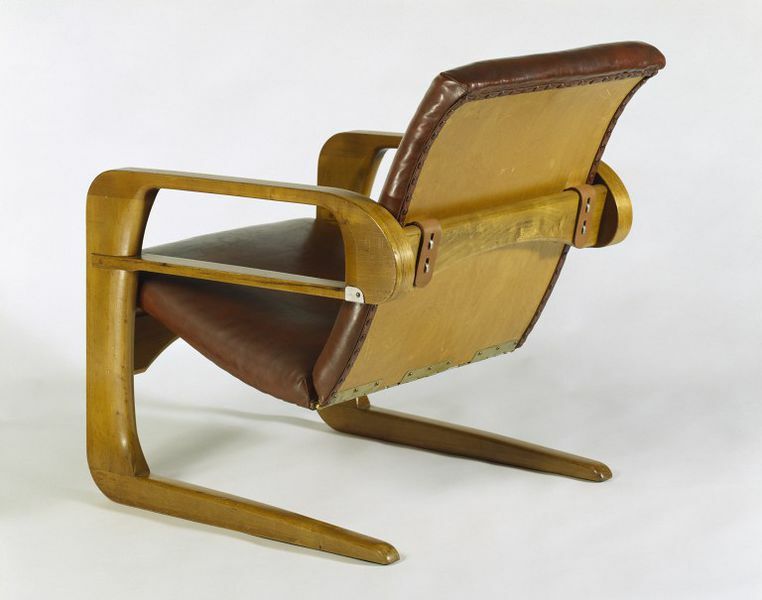 Although the Airline chair seemed destined for great commercial success, factory production of it never became a reality, despite extensive discussions between Weber and many American manufacturers. Three hundred chairs were ordered by Walt Disney Studios for use in its projection rooms, lounges, and offices, but they were made by a local cabinetmaker rather than a major furniture producer. Cantilevered armchair. The chair has three principal parts: two C-shaped side arm/leg assemblies and a moulded plywood seat, upholstered with 'Naugahyde' PVC imitation leather, which rests of wooden stretchers. Each arm/leg assembly has three pieces: a floor support, an upright and an armrest, joined using mortise and tenon joints. A horizontal strut passes underneath each armrest, strengthening the chair. This Airline chair was one of a group commissioned by the Walt Disney Studios, Burbank, California, and made in 1939. Kem Weber was the architect of the project and the upholstery was chosen by the client. The chair was purchased by the V&A in 1991 [91/1080]. The large, comfortable lounge or club chair is a design problem that was addressed between 1917 and 1932 by early modernist architects in Europe: Gerrit Rietveld, Marcel Breuer, Ludwig Mies van der Rohe, Alvar Aalto. few American seating designs of the interwar years were able to match the inventiveness of the European works. Karl Emanuel Martin Kem Weber was born in Berlin, Germany, he trained in Potsdam under the royal cabinet-maker, Eduard Schultz, and at the School of Decorative Arts in Berlin. The outbreak of the First World War meant that he found himself stranded in America, during visit to supervise the building of the German pavilion for the Panama-Pacific International Exposition of 1915. At the time, Weber was assistant to Bruno Paul, the architect who had designed the pavilion. Weber chose to stay in America, becoming a US citizen in 1924. The design of the Airline Chair is descended aesthetically and intellectually from a cantilevered chair from Weber’s ‘Bentlock’ group of furniture, designed in 1931 (see p.121, fig.123 of Christopher Long's book, Kem Weber: Architect and Designer). The 32 designs (including mirrors, cabinets, chairs and tables) in this group were so-named after the presence of a wooden fixing ‘lock’, glued at points where their supportive members were bent. Each of the chairs in this series had arms and legs formed from a single length of wood, a notch was cut where the wood would be bent and in this notch the lock was glued. The bending and glueing could be done in a single process. Although widely admired and quite affordable (an entire room set could be bought for $250), the ‘Bentlock’ series was not a commercial success, owing in part to the restrictions placed by the Great Depression on most peoples’ domestic budgets. This led to a period of financial uncertainty for Weber. 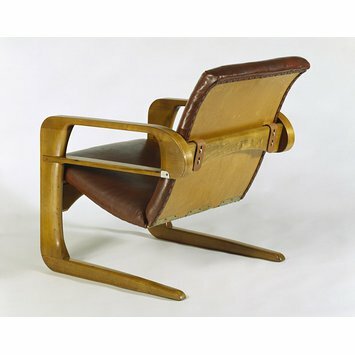 The Airline Chair was originally designed in 1934-35, it was conceived as a lighter version of the ‘Bentlock’ cantilevered chair. Weber wished it to also be easier to assemble than its predecessor. The ‘Bentlock’ assembly was eliminated from the design, replaced with mortise-and-tenon joints where the arms met the uprights, and where the uprights met the floor supports. The chair was designed to move and sink when sat in, and was so strong it was reported that it could withstand up to 1000 lb of weight. The design of the chair was apparently inspired by Weber’s interest in bow-making. Despire the removal of the single-piece arms and legs, the overall effect of the chair is still sweeping, flowing and streamlined. The chair was a very early example self-assembly furniture, it was sold in a broken-down state, inside a thin wooden box with a built-in handle. Significantly, the chair could be assembled without tools. Aside from obvious advantages for retailers in terms of shipping and storage, Weber imagined that the chairs would be disassembled by owners, then taken and used outside. Much of the contemporary advertising used attractive, young female models, perhaps indicating the target market, but also recognising that at the time women tended to control household budgets. Unfortunately, the chair again failed commercially, but achieved fame as the seating used in the Walt Disney Studios’ projection room, after Weber won a commission to design the complex at Burbeck, California. The material used for this chair's upholstery is a brand of imitation leather called 'Naugahyde', first trademarked in 1936, named after the borough of Naugatuck, Connecticut, where it was originally made. It is composed of a woven fabric backing, coated with expanded polyvinyl-chloride (PVC). Naugahyde was marketed as a convenient, easy-to-maintain substitute for leather that could be used to seamlessly cover larger sections of furniture than would be possible with real leather hides. In the 1960s and 70s Naugahyde was advertised humorously as being the skin of a fictional animal, the Nauga.